I wish I knew, like... every language. Just think of all the cool games that would open up! For example, I don't know Polish. As such, I can't currently play Zaklinacze. However, my uni-linqual self will soon be able to give it a shot, as it's being translated to English as Enchanters. The fantasy card-drafting game is up on Kickstarter now. 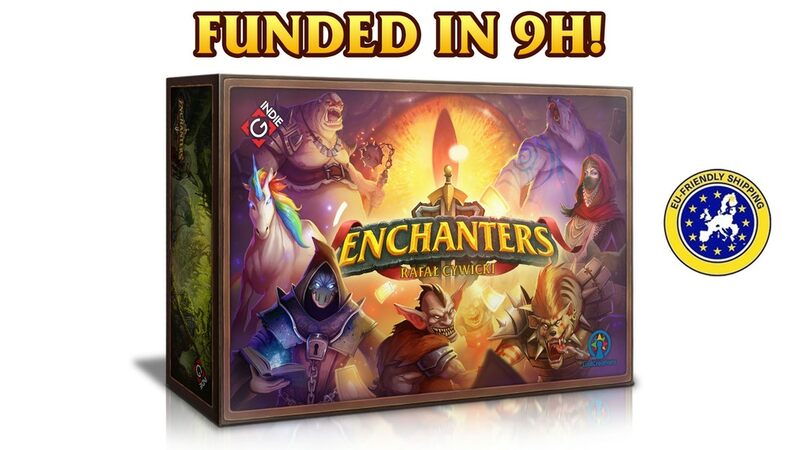 Enchanters is a fantasy card drafting game. Players take turns to go on quests to take cards from the Journey track. Each one collects Items on one stack and Enchantments on the other to craft a magical artifact. Part of every card taken stays with them until the end of the game. When monsters approach, they journey onward to defeat in a deterministic combat encounter (that takes just few seconds) and score points. From time to time players rest to gain crystals or heal wounds. The game has passed its funding goal, so it's on to stretch goals for the next 23 days.